The initial ultra-complicated watches appeared due to watchmakers' ambitious attempts to unite a great number of functions in a case of a single timepiece. The mechanical clocks with a wide range of functions, including astronomical indications, suggested ideas to the developers of the first pocket watches. As a result, as early as in the 16th century, the horology world witnessed the appearance of numerous complicated and even ultra-complicated watches. 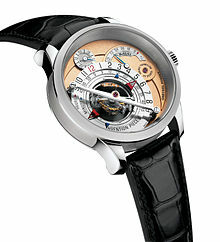 Ultra-complicated watches are produced in strictly limited numbers, with some built as unique instruments. Some watchmaking companies known for making ultra-complicated watches are Breguet, Patek Philippe, and Vacheron Constantin. As of November 2018, the top four most complicated mechanical watches ever created are manufactured by Vacheron Constantin and Patek Philippe, respectively. In particular, the Patek Philippe Henry Graves Supercomplication currently holds the title of the most expensive watch ever sold at auction, with a final price of 24 million US dollars (23,237,000 CHF) sold in Geneva on November 11th, 2014. Two Patek Philippe Calibre 89 also currently rank among the top 10 most expensive watches ever sold at auction, with final prices over 5 million US dollars. 1) The Vacheron Constantin Reference 57260 is now widely regarded as the most complicated watch in the world. It is a mechanical pocket watch which features 57 complications, introduced by Vacheron Constantin in 2015. The company claims that it is the most complicated mechanical pocket watch ever created. The Reference 57260 took eight years to assemble, and has 2826 parts and 31 hands. It weighs 957 grams, and spans 98mm. 2) The Patek Philippe Calibre 89 has 33 complications, using a total of 1728 parts. It was released in 1989 to commemorate the 150th anniversary of the company. The complications include the date of Easter, sidereal time, and a 2800-star celestial chart. 3) The Supercomplication delivered to Henry Graves, Jr. in 1933 has 24 complications. The watch was reportedly the culmination of a watch arms race between Graves and James Ward Packard. The Super-complication took three years to design and five to build, and sports a chart of the nighttime sky at Graves' home in New York. It remains the most complicated watch (920 parts) built without the assistance of computers. 4) The Star Caliber 2000 has 21 complications. They include sunrise and sunset times and the lunar orbit, and it is capable of playing the melody of Westminster quarters (from Big Ben, the clock tower of the Houses of Parliament in London). The Franck Muller Aeternitas Mega 4 is the world's most complicated wristwatch. It has 36 complications, 25 of them visible, 1483 components and 1000-year calendar. The Hybris Mechanica Grande Sonnerie is the world's second most complicated wristwatch. Powered by the Jaeger LeCoultre Calibre 182 movement, with 27 complications and over 1300 parts. The movement is housed in a 44mm by 15mm 18k white gold case. 24-hour watch has an hour hand sweeping through 24 divisions where most watches have a 12-hour dial. Automatic watch (self-winding watch) uses the motion of the wrist and arm to recapture energy. Chronograph has a second hand that can be stopped, started and restarted for measuring time periods. Flyback chronograph, rapid reset of the chronograph as it is running, with the chronograph continuing to run immediately after with no delay following the reset. This is faster than the stop-reset-start required of normal chronographs. Tourbillon Considered by some to not be a complication, a tourbillon is a mechanical refinement to an escapement that mitigates the effects of gravity on the operation of a timepiece. Sometimes various displays in or on a watch are counted as complications even if they have nothing to do with timetelling. Often-seen examples include thermometer, barometer (rare in watches; more frequent in clocks), compass, or altimeter. Many horologists will not count nonhorological complications when adding up the number of complications on a given watch or clock, and some purists even exclude the power reserve from the complications count because it does not show a time indication (although its function is related to timekeeping). ^ "Ultra-Complicated Watches - Unlimited Sophistication Watches Channel". watches.infoniac.com. ^ Perez, Carlos (June 10, 2001). "Of the Blood Royal". Carlos' Journal. TimeZone.com. Retrieved 2008-04-20. ^ Nicolet, J.C. (1999). "What does the term 'complication' mean, and how does it differ from 'grand complication'?". Questions in Time. Europa Star magazine online. Retrieved 2008-07-09. ^ Watches - Switzerland - Information - swissworld.org, Federal Department of Foreign Affairs, General Secretariat, Presence Switzerland. ^ Mulier, Thomas; Pulvirent, Stephen (November 12, 2014). "Most Expensive Watch: Patek Philippe Supercomplication Sets Record at $24 Million". Bloomberg.com. Retrieved November 12, 2014. ^ "The story of the 'most complicated' watch in the world". BBC News. November 11, 2014. ^ "World's Most Complicated Wristwatch: Franck Muller Aeternitas Mega 4". January 11, 2010. ^ "Jaeger-LeCoultre: Hybris Mechanica à Grande Sonnerie". June 19, 2009. Perez, Carlos (June 10, 2001). "Of the Blood Royal". Carlos' Journal. TimeZone.com. Retrieved 2008-04-20.